The 2018 Nissan Frontier, known as America’s most affordable pickup, is a great performer – practical, rugged and safe, but comfortable and with a bit of attitude. Learn more about the new standard features in the 2018 Nissan Frontier at Speedcraft Nissan in West Warwick. New features include Bluetooth connectivity, a 5-inch screen, cruise control, air conditioning and a rearview camera. The 2018 Nissan Frontier now starts at $19,965 for the base king cab model with a four-cylinder engine and a five-speed manual transmission. Four-wheel-drive models start at $28,835 because they come standard with the optional V-6 engine and are only available from the SV trim and higher. The 2018 Nissan Frontier kicks out up to 261 horsepower, and has a towing capacity of up to 6,710 pounds. Choose from a crew cab standard bed, a king cab standard bed or a crew cab long bed. Its full-length, fully boxed ladder frame is built from steel with super high tensile strength. Chrome is available on the rear bumper and front grille, and a rear spoiler mounted on the tailgate reduces drag. A spray-on protective bedliner is available as well. Drivers like the Utili-track cargo-carrying system, which allows them to placed the four aluminum-alloy cleats anywhere to keep everything strapped down, no matter how awkward the load. The cargo bed light is a nice feature along with the cleverly placed lock for the tailgate. a Crew Cab Long Bed, there’s plenty of room for cargo. Available exterior colors are lava red, cayenne red, forged copper, magnetic black, gun metallic, brilliant silver, glacier white, arctic blue metallic. The 2018 Nissan Frontier comes in king cab and crew cab. 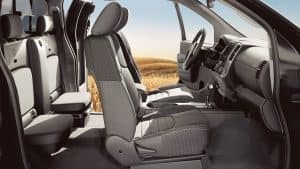 The crew cab offers seating for five, and the king cab, with no B-pillars, features doors that open wide for easy access. There’s a storage tray under the rear seat, which is removable. Both rear seat cushions flip up for extra room. The crew cab has a 60/40 split flip-up rear bench seat, plus a flat loading floor. Stay powered up while you drive. Charge your laptop or cell phone while running a video game through the Frontier’s two auxiliary 12-volt DC power outlets. Interior colors include graphite steel cloth, beige leather, steel leather, graphite leather, crew cab beige cloth, crew cab steel cloth, SV graphite cloth, king cab beige cloth, king cab beige cloth, S graphite cloth.